Click here or on the photo to go to the listing to sign up. 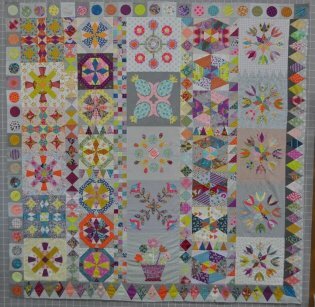 Sandy has made a great block of the month quilt using our favorite Free Spirit Solids and traditional quilt blocks created by some fabulous pattern designers provided by Moda Fabrics. This BOM is the perfect next step for beginners who want to tackle some block construction and take part in a monthly BOM program while also being a fun program for more advanced quilters who just want a fresh, fun quilt to jump into. The price for the program is $225 paid in full for 12 months of block instructions (with multiple sizes of the blocks included for future use) plus setting instructions and expert tips given by Sandy Stites each month. There is also a monthly payment plan option which will be a $40 deposit and $20 per month through paypal only. Golden Days 2018 BOM - Click here or on the photo to go to the listing to sign up. h 2018, Golden Days! Golden Days features laser-cut acrylic and mylar templates. Participants receive the templates and block instructions each month over the course of a year. Our fabric option will be similar to the Jen Kingwell blocks seen here. We may offer a second choice of color with darker backgrounds like we did for Delilah if there is enough interest, so let us know if you would like a darker background option. We have limited spots for this program. There are no refunds on this program although we are happy to try to help you sell your spot to someone on the waiting list if you find you cannot participate. You can have this program mailed to you for an additional shipping fee. If you love English paper piecing, you won't want to miss our 2018 EPP block-of-the-month quilt program, Salute to Levens Hall! Join Mary Lou Mojonnier at Intown Quilters for this 12-month stitch along to create your version of this quilt using the supplies you purchase separately here. * You purchase your pattern, paper-pieces, fabric and meeting time separately for this program. You'll have the help and support of Mary Lou and a group of fellow hand-piecers, too, and maybe even some fun fabric swapping to help you with your vision. If you want to join in with others to make this quilt, you can sign up for the monthly meeting which will be on the 1st Saturday of the month at 9:30am, through this link. What better way to spend a few hours once a month (or maybe even twice if you join the By Hand group on the 3rd Saturday here). We can't wait to see the quilts that come out of this group! We are hoping to see some other color-ways besides the two seen in the photos to the right. MaryLou already has a plan for a pale pink grunge for her background which will be arriving at IQF&Y soon. Email us if you would like to be alerted when that fabric arrives. 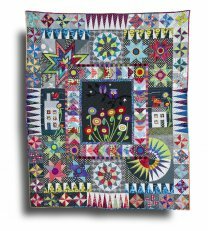 including foundation paper piecing, appliqué, machine piecing and there's even room to embellish with embroidery or crazy quilt style stitching. This stitch along begins January 2017 on the first Tuesday of the month with the monthly Paper Piecing & More Club. * You purchase your pattern, fabric and meeting time separately for this program. Kits will be available; please email us if you'd like us to let you know when they're ready. If you would like to order this to be shipped, we will ship you everything at one time as if a kit. You'll have the help and support of Wanda and a group of fellow paper piecing fans, too. If you want to join in with others to make the Urban Owls quilt, you can sign up for the monthly meeting on the 1st Tuesday of the month at 4:30 p.m. through this link. 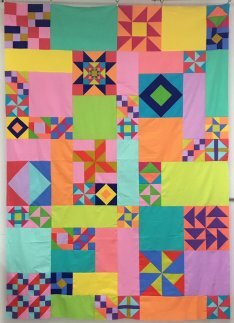 Kaffe Fassett Mystery Quilt Update! This ten month program started in March 2018. 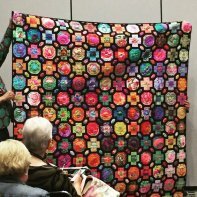 Enjoy 10 months of creating with the 2018 Kaffe Fassett Mystery Quilt program! 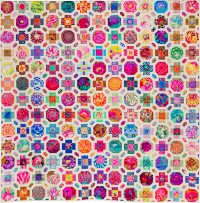 Each month (from March-December 2018), you'll receive fabric and instructions for this mystery quilt along program, designed by the Kaffe Fassett Collective. The finished quilt measures approximately 82-1/2" x 82-1/2" and participants have their choice of two color options: Pastel and Dark. The only way to take part in this program is to register online and send us your first choice of color and we will do our best to get you that color and give you the option to cancel if you don't get the color you want. Packet pick up is currently slated for the 4th Sunday of the month. You can have this program mailed to you for an additional shipping fee. * $180 flat fee for the fabric and instructions when paid in full.